There seem to be two different gluten free diets. The type that people do because they have gluten intolerance or celiac and the type people do because everyone else is singing the praises of a gluten free diet. But like other fads, there are pitfalls and critical thinking is essential. I do not want to discourage people who would benefit from a gluten free diet from doing one. I do want to encourage folks to think critically about their food choices. Read labels! Did you hear that?! I said, READ LABELS! Yes, it’s really that important. When I shop, my thinking goes something like this, “Would I have eaten something with this nutritional profile before I was gluten free?” If the answer is no, then I think hard about why I want to buy it. Am I buying it because it’s the only option? If yes, then do I actually need it? If yes (i.e. I am not willing to stop eating x all together), then I will go home and use Mr. Google to find a recipe and learn how to make it myself without the bad stuff, and using better grain choices. What I’ve written below is part awareness raising and part encouragement toward critical thinking. I’ve written this because I do not want my website to be just another cog in the wheel encouraging people to buy into a fad. Going gluten free because “it’s healthier”? That’ s a rather blanket statement and depending on what you’re stating it’s healthier than, quite possibly inaccurate. Yes, it’s healthier for people with actual medical issues but what do we even mean by “healthier”? What makes it healthier? Is it the lack of wheat and associated GMO? Then why not eat organic ancient grains? Is it the idea of replacing white bread with something healthier? Many gluten free items contain starches that have no nutritional value but are necessary to mimic gluten in baking. Is that actually “healthier” than white bread? Store bought gluten free products are often dense in carbs and calories and low in nutrition. Here’s an example: the organic, yeast free, sugar free, wheat free, whole grain spelt bread I used to eat was “healthier” than most gluten free alternatives that had corn syrup, corn starch, tapioca starch, sugar, white rice flour. The spelt bread just wasn’t healthier for me. It’s really not that dire though, there are nutritionally dense products out there, they just tend to be even more expensive. You have to be willing to do your research and not just blindly throw products in the cart thinking gluten free = healthy. Going gluten free to loose weight? This is also a bit of a tricky one. As a blanket statement, “a gluten free diet will help me lose weight” is a bit silly. Yet, some people will lose weight and lots of it. People will fill up the void created by cutting gluten with healthy or unhealthy choices. Some people will end up cutting almost all grains, increase veggies and fruit, switch to whole (gluten free) grains rather than their previous white flour goods, or just eat a more balanced diet generally as a result of cutting gluten. Other people will run to the frozen isle, find the gluten free section, and stockpile breads, muffins, donuts, cinnamon buns and replace their old carbs with carbs that possibly worse. Perhaps going gluten free would help you lose weight but if your only goal is to lose weight, a better focus might be to increase exercise, water and veggie intake or just take a really good look at your habits and see if there is room for improvement. Or perhaps, just perhaps, your body is actually really happy where it is and doesn’t want to go on a fad diet. Going gluten free to feel better? It makes sense to eliminate foods to see what might make you feel better provided you’re actually not feeling well, or if you suffer from illnesses related to digestion. Sometimes, we can attain a grater level of health. The question that’s really important to ask yourself when doing elimination diets is, what else shifted when you cut gluten. Did your meat and cheese sandwich go the way of the Dodo and now suddenly you’re a salad with hard boiled egg kinda person? Did you suddenly give up grains for root vegetables? Were baked goods also the only source of eggs in your diet? My encouragement here is pay attention. Perhaps it’s better balance, less processed food, less sugar, no eggs, more vegetables, that is making a difference. But then again, perhaps it is cutting gluten that makes you feel better. Remember, it’s okay to ask for help too. My healthcare practitioners really helped me feel empowered and gain knowledge. There is so much information out there and I really believe that for most people the only way to really “get it” is to actually study it and continue to study. Since not all of us want to become doctors, nutritionists, etc. why not ask those who know what they’re doing for help? If you suspect you may be Celiac then get your hiney to a doctor. There are some pretty serious implications with Celiac disease and it shouldn’t be taken lightly. Cutting gluten will help you avoid further injury to your body. However, you may also need to heal damage that the previous gluten has caused. My Naturopathic Doctor helped me with the healing process and for that, I am grateful beyond words. I really want to encourage people to think about their diet within the context of the bigger picture. Gluten free information is everywhere, products are popping up all over the place, there are advertisements in health magazines and so on. This is really permeating our thinking and I’m not sure that’s entirely good. What is good is that there are options for people who cannot eat gluten. Yippee! What isn’t good is that manufacturers seems to be using this awareness as a tool to sell us crap food at exorbitant prices. It was my realization of how non-nutritious many of the GF choices were and the associated ridiculous cost that led me to start developing my own recipes. Finding the best, healthiest way possible to be gluten free without giving up too much of my favorite things is important to me. It’s all about balance. Some of my recipes are for unhealthy things like cakes, and cookies. In my family, we call those “good, delicious and non-nutritious.” Those aren’t great food choices but food is social and we have birthday parties, holidays etc. Gluten free people shouldn’t have to stand on the sidelines while people enjoy their cake. 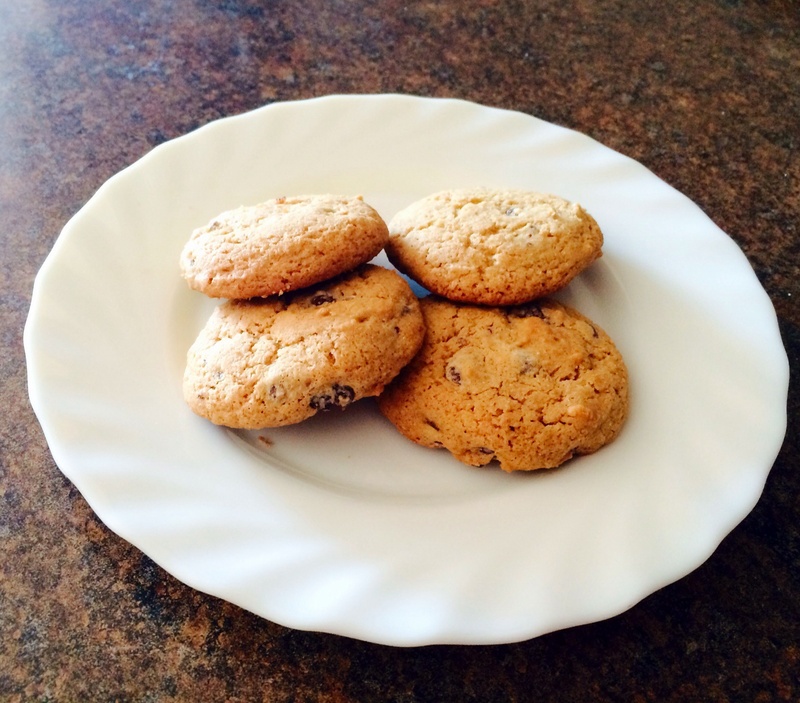 I’ve tried to find ways to increase the nutritional profile of the recipes I’ve made. I’ve used pseudo-grains, avoided common allergens when possible (nuts, soy, pea flower, for example) and tried to decrease the starches I use (a work in progress). My recipes should be used with the same critical thinking skills I encourage above. These are tasty substitutes for their gluten containing counterparts. But it’s really not a good idea to eat chocolate cake every day, gluten free or not. So please, enjoy the recipes, use them, and by all means improve them and make them part of your balanced diet! When I was a young adult and had first lived on my own, I got really into making Lemon Bars. I lived in this little basement suite with my cousin and I would make lemon bars in our tiny kitchen. Any occasion would call for Lemon Bars and I even made them for bake sales when extended family would ask me to. Thinking back, it’s a bit surprising because I also worked as a baker. You’d think I would get tired of it but apparently not. Recently, I decided to revisit the Lemon Bar. These are not something I would normally make any more because they have more sugar than I prefer to work with and I cannot figure out how to substitute coconut sugar or any healthier alternative. The reality is that these babies require standard granulated sugar. However, my husband was barbequing up a feast last week and needed lemon for his marinade. The store only had bags of lemon so we had lemon to spare. I so happen to have two potlucks this weekend so viola … Lemon Bars! Prepare the crust first. Preheat oven to 350F. Using the whisk attachment for a stand mixer combine all the ingredients for the crust and mix until it is course and mealy. Press the mixture into a greased 9×13 pan and bake for 18-20 minutes. While the crust is baking prepare the filling. Using the whisk attachment again mix all of the wet ingredients, then add the lemon zest and sugar and beat until incorporated. Slowly add in the flour, tapioca starch, xanthan gum and baking powder and beat until smooth. Pour over the par-baked crust and bake another 18-20 minutes until the filling is set. Remove from the oven and sprinkle with icing sugar. When the bars have cooled slice into bars. My experience playing with GF flours seems to have paid off. I am finally comfortable altering recipes without feeling obligated to first try them as is. This skill served me well over the weekend when I decided it was time to learn to make gluten free hamburger buns. Grilling season is approaching, in fact my BBQ loving husband has already fired up the grill a couple of times. We enjoyed some lovely organic, grass fed burgers over store bought buns. Honestly, they’re not too bad. Some of the GF buns are actually okay if you toast them. But it seems so silly to spend oodles of money on the healthiest meat only to wrap it in a bun devoid of nutritional value. So the bun-baking experiments began. 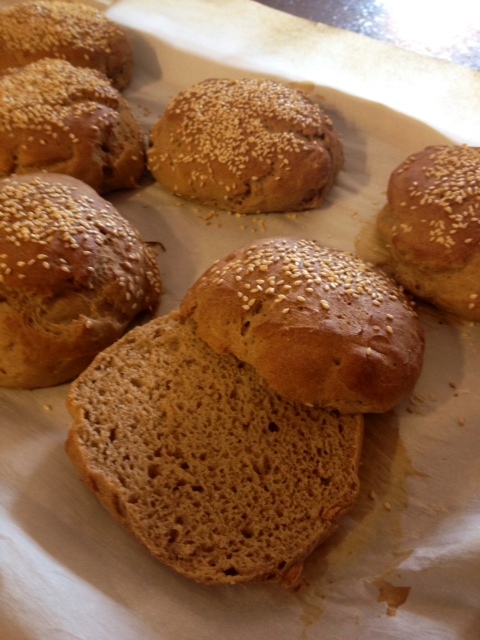 A week or two ago, I tried to form my regular bread recipe into buns but they turned out a bit dense and more like a kaiser than a hamburger bun. I opted to keep researching and keep trying and that’s when I came across this recipe. I liked the simplicity of the recipe and I could tell (from my previous bread-baking experiments) that it would likely work out quite nicely. The photos of beautiful looking buns helped too. I try not to bake with too much rice flour so I opted to try the high fiber flour blend recommended b y Living Without on their handy dandy Substitutions List. I used sorghum, teff, millet, tapioca starch and corn starch. The flour blend did not disappoint. Now, picky eaters could be triggered into denial of the deliciousness of these buns based on the darker, brown colour of the teff flour. I have not found a light teff flour yet but I don’t mind if my food looks funny. Purple potatoes are delicious so why not brown bread 😉 If your family doesn’t like strange looking food, you may want to use something other than teff flour. In order to re ally feel like I could recommend this recipe to you, I just had to try it loaded up with ridiculous amounts of veggies. 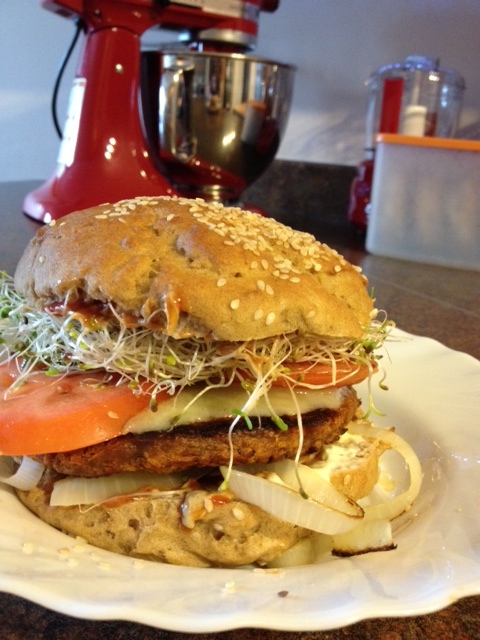 So I piled on the sprouts, tomato, onion all over a veggie patty. Guess what!? This bun has staying power! It did not crumble, I was not left eating the last of my burger with a knife and fork. I didn’t need a box of napkins to clean up my hands after. In fact, I’d say my hands were about as dirty as they would’ve been had I eaten a wheat bun! Really. It’s true. Warm the eggs in a bowl of hot water if they are not already at room temperature. Proof the yeast by measuring out the hot water, stirring in the honey then adding the yeast. Let this stand for about 5 minutes or until it is foaming. Meanwhile, measure the rest of your wet ingredients into a stand mixer and blend lightly. Gently stir in the yeast mixture (when it is ready). Pour in the flour and blend for two minutes on medium-low. The dough will look like sticky cake batter more than traditional bread dough. It should fall off the paddle but not be runny. Drop the batter on to a parchment lined baking pan or a greased bun pan, dividing the batter evenly between the buns (8-10 buns). Shape the buns (see notes). 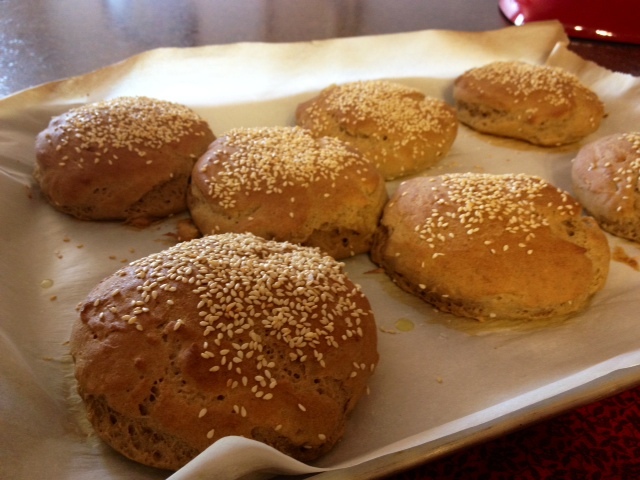 Gently rub olive oil over the buns and add sesame seeds or salt. Let rise in a warm spot for 30 minutes. Bake at 400 degrees Fahrenheit for 12-15 minutes until golden brown and the internal temperature is 180 degrees. Shaping the buns: The dough cannot be shaped as regular gluten dough would be because it is so sticky and delicate. It can flatten out and become dense if over-handled. Water is the only answer. Use wet fingers or a wet silicone spatula. I prefer to have a bowl of water and a mini silicone spatula near by while I’m working. Once your dough is evenly divided, use the wet, spatula to give the buns a nice shape. These will puff up really nicely as you bake them so focus on getting them to the correct diameter and let the rising and baking attain the height for you. Don’t worry too much about getting the buns wet while shaping, this will not harm them unless you really soak them. Oiling the buns: I prefer to use my hands rather than a pastry brush as the dough is very soft and the brush can leave lines in the dough. Getting a rise: Make sure the ingredients are at room temperature as this will help the rise. They did not appear to rise much in the 30 minutes I left them but did nicely in the over. The texture was quite airy and there were definitely nice air bubbles (see second picture), so don’t worry if you don’t see too much difference in size before you pop them in the oven. On flour: If you live in Vancouver, BC it is probably worth your while to make a trip to the flour isle at Famous Foods. They carry a wide range of flours, can answer questions readily and are more affordable than any other place I have found in Vancouver.